Below is another article in a series of blog entries I’m writing as a candidate for president of Red Sox Nation. The day was May 16, 1986. I was playing left field and Brockton’s lead was something like 19-3. Major league scouts perched along first and third baseline fences, waiting for another glimpse of McMurtry’s majesty. I and the rest of the players there that day hungered for a chance to do something heroic in front of the scouts, to begin our dream-like march to the bigs and the Baseball Hall of Fame. But by the sixth and second-to-last inning, it didn’t look like I was going to get that chance. Then, the first three or four Brockton hitters reached base to start of the bottom of the sixth inning, so I was summoned to the mound to quash yet another Brockton rally. I remember trotting in from left thinking, When is McMurtry coming up? As I threw my warm-up pitches, I overheard a scout ask my coach, “What’s this new guy’s name?” The last few warm-ups were the hardest fastballs I had ever thrown. The first batter I faced waved his bat at three smoking fastballs, missed them all, and sat down. Holycrap, I thought, I just wasted that guy in front of twenty major league scouts. I’m gonna be a pro! As I watched the next Brockton player step into the batter’s box, I heard some scouts buzzing. One, in an Astros cap, help up his radar gun and pointed it at me. I was being noticed. The next batter watched the first two fastballs tear by him for strikes, fouled off a curveball, then swung mightily under a high heater for strike three. I tried to stay calm. OhmyGod. I’m blowing away the best hitters in the state and twenty major league scouts are watching. I looked over at my father. He was beaming and talking with a rotund man in a Dodgers cap who was holding a clipboard. I’m gonna be a Dodger! The next batter stroked my first pitch to right field, a clean, line drive base hit. No problem, they’ll forget about that when I nail this next guy. But I walked him. And the next batter singled, loading the bases. And as another Brockton batter walked to the plate, I saw the marvelous figure of Greg McMurtry swagger to the on-deck circle. He carried a black bat with a red donut on it and stared at me, calm but fierce, like a panther patiently eyeing a rabbit he wants to maul. Relaxed, he swung his bat one-handed over his left shoulder, then switched hands and over his right shoulder, showing beautiful, hard muscles like in a Michelangelo sculpture. I forced myself to avert my eyes and focused on my catcher, looking for the signal. I knew I would fail to retire this batter. That McMurtry would come to the plate seemed inevitable. I could feel the two of us being tugged toward confrontation by the strings of fate. (I seriously doubt Greg felt the same thing.) Sure enough, the batter preceding McMurtry hit a ground ball that squeaked through the hole between the third baseman and shortstop. A couple of runners scored, and Greg McMurtry stood at home plate to give them high-fives. 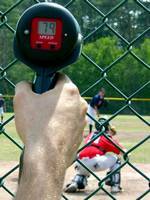 The scouts adjusted in their lawn chairs and pointed their video cameras towards the batter’s box. McMurtry stepped to the plate with the confidence of a superhero. Sweating and trembling, I faced the awesome challenge standing sixty feet, six inches before me. The catcher put down two fingers, signaling a curveball. Good idea, he won’t expect that. High, ball one. I was relieved I had survived the first pitch and I relaxed a little. Again, the catcher called for a curveball. Ingenious idea, he certainly won’t expect another curveball on a 1-0 count. High, ball two. The catcher tossed the ball back to me as the scouts moaned, worried that I would give McMurtry nothing good to hit and issue him a walk. Hold on a second, this is Greg McMurtry. Don’t play around with him, I scolded myself. This is your chance for glory, the moment you dreamed of in every wiffle ball game growing up. Wake up and go after him. For Godsakes, don’t walk him! I realized I had made an error of, perhaps, historic proportions in the annals of the Crawford family. Holycrap, I’m one pitch away from striking out Greg McMurtry in front of twenty major league scouts. I looked over at my coach. He was pacing and smiling, arms crossed, savoring the possibilities of the next pitch. “Go get him, Robby!” he said. “One more, one more, kid!” I looked at my father. He smiled at me, winked, and pumped his right fist. With his left hand, he wiped the sweat from his forehead. I looked in for the sign. McMurtry leaned in a little more over the plate to protect the outside corner. The perspiration on his steel forearms glistened in the sun. The catcher put down a single finger and I threw the ball as hard as I could. McMurtry stepped into the pitch but held his swing. Outside and low. Ball three. “Full count!” bellowed the umpire, who was obviously auditioning for the majors, as well. I got the ball back from the catcher and closed my eyes. Please God, don’t let me walk him, don’t let me walk him. I glanced over at my dad. He and the Dodgers scout were chuckling, the scout carelessly and my father nervously. Our eyes met and his seemed to say, “Oh boy, Rob, you’ve really gotten yourself into a situation here!” McMurtry started at me. I could tell he wanted a chance to show those scouts that his futile swing had been a fluke. He wanted to take me deep. The catcher didn’t even bother with a sign. It was fastball all the way. Just hum it in there and see what happens. I looked at the mitt and tried to focus. 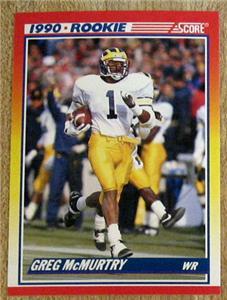 I tried to block out my teammates, the scouts, my coach, my father, even Greg McMurtry. I tried to block out the full count and the fact that the next pitch would be remembered and talked about in my family for years to come, regardless of the result (and it has been!). Then, pulled along in the current of time and fate, I wound up and delivered my pitch, a fastball that I tried to guide with my will as it approached home plate. The scouts watched, my father prayed, my coach grinned, and Greg McMurtry checked his swing as the ball crossed the outside black of the plate. “Ball four,” said the umpire non-chalantly, rising from his crouch. I shrugged as McMurtry glided toward first base. He proceeded to steal second before one of his teammates flew out to end the inning. That summer, the Red Sox drafted him in the first round, but he chose college instead and starred for Bo Schembechler’s Rose Bowl-winning Michigan Wolverines for four years. He was drafted by the Detroit Tigers (27th round) and New England Patriots (3rd round) in 1990, and played wide receiver for the Patriots and Bears for five seasons, during which he had 128 receptions for 1,631 yards and five touchdowns. He was out of major pro sports at the age of 27. I never saw another athletic moment as important or dramatic (to me) as my 3-2 pitch to Greg McMurtry. That day, that situation, was the closest I ever came to my dream (and every kid in Red Sox Nation’s dream) of being drafted by the Boston Red Sox. Greg McMurtry wouldn’t recognize me if I walked right up to him and introduced myself. But the image of his chiseled body, his confident glare, and his one elegant, lusty whiff at a Rob Crawford fastball will be with me always. This entry was posted in Baseball, Children, Family, Life, Parenting, Red Sox Nation, Sports. Bookmark the permalink. Great story and great story-telling – thanks for sharing that! I got caught up in the suspense but (with great annoyance!) had to let my very insistent dog out into the backyard at 3-2… Boy did she have bad timing! But I still loved the story. Thanks. I was wondering what ever became of McMurtry & decided to Google him, and this gem came up. Fantastic story. Thank you so much for sharing it. in mind of. I say to you, I definitely get irked while folks think about issues that they plainly do not recognise about. is the greatest I have came upon till now.